How Long Did It Take to Write Some of the World's Most Popular Books? How Long Did It Take to Write Some of the World’s Most Popular Books? Amateurs may think that inspiration drives artistic production, but professionals know the muses are rarely to blame for creative clogging. 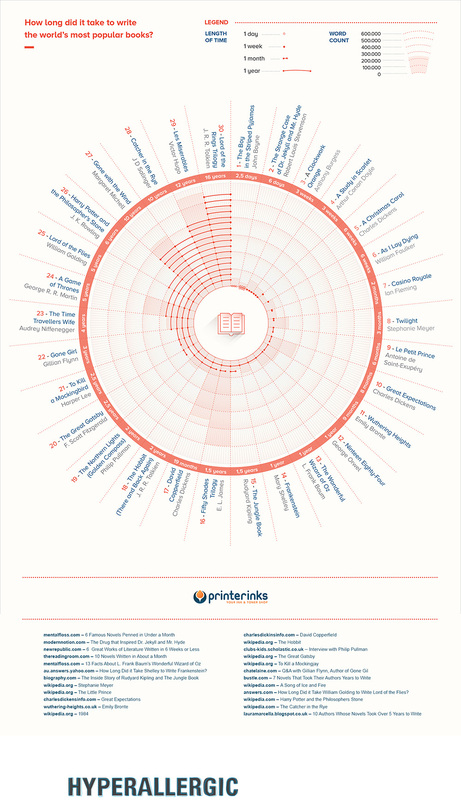 This infographic by Printerinks charts how long it took to pen some popular novels and literary masterpieces. It’s not an exhaustive list, but hopefully it will motivate those of you who refuse to believe you can forgo that weeklong vacation to write your novel — Robert Louis Stevenson appears to have had no trouble, and he probably even rested on the seventh day.